Actor Lakeith Stanfield, CROWN HEIGHTS, Photo Courtesy Amazon and IFC Films. It’s the end of 2017 (no, it wasn’t a bad dream) and if you’re lucky you will find yourself with some extra time to catch up with what you may have missed in the theaters this year. 2017 was a wicked year of historical fiction and documentaries. Amazon is releasing Crown Heights on DEC 8 and I’d put it at the top of your list of movies to watch. Historical Fiction as a genre can often run the risk of revisionist history. In the case of Crown Heights, the least history can do for Colin Warner, his family, the sixteen-year-old boy, Mario Hamilton, whose life was senselessly ended on April 10, 1980 and the estimated 120,000 wrongfully incarcerated people in our country is to enable audiences to witness from beginning to end the story of how one lie can unravel the criminal justice system and render it unjust. (l-r) Actor Nnamdi Asomugha and director Matt Ruskin, CROWN HEIGHTS, Photo Courtesy Amazon and IFC Films. 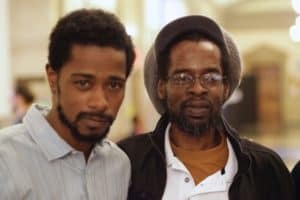 The gestalt of Crown Heights is that the problem of wrongful incarceration is bigger than Colin Warner (Lakeith Stanfield). The story is bristling with booby traps for any writer and director– Matt Ruskin (Booster) is making a dramatic film about men he respects for moviegoers that are more of a spectrum than an audience. Some may know parts of the story or nothing at all, some may have a vested interest in the story, some may be closely aware of the details but may or may not be invested in the story. It’s a challenging task for a filmmaker dedicated to both craft and historical authenticity. On February 11, 2005, an episode of This American Life entitled, DIY, aired introducing public radio audiences to Warner and his best friend, Carl King (KC). It was King’s odyssey through the legal system with his only motive being Warner’s exoneration that became the cornerstone of the film. Writer and director, Ruskin dramatizes this horrific miscarriage of justice and the result is a loving film that’s also a testament to why our country shouldn’t live without public radio. Said Ruskin – “I remember when I heard the piece, I couldn’t get it out of my head…I knew their story would make for a really compelling film.” Indeed, Colin Warner is a dynamic means for bringing the story forward. Arrested at the age of eighteen, convicted and sentenced to fifteen years to life in prison, Warner was swallowed by a machine of injustice, fueled by a political climate that was obsessed with convictions. The result is that we never get to know Mr. Warner like we get to know King. The film becomes less about the experience of a man who is wrongfully incarcerated than it is about the man who fought tirelessly if not obsessively to the point of almost destroying his marriage and losing his home as played by actor and former NFL player, Nnamdi Asomugha (Hello, My Name is Doris). What is missing is the impetus for King’s fervor. It thins the story that is otherwise so rich in context. He does offer the rationalization that it could have been him but somehow it doesn’t come through as reason enough. (l-r) Actor Lakeith Stanfield and Colin Warner, CROWN HEIGHTS, Photo Courtesy Amazon and IFC Films. What does come through the film is the gross unfairness of the criminal justice system to people of color who can’t afford adequate legal representation. Ruskin has a knack for knowing when it serves the story to dramatize events and when to allow history to speak for itself. There is a parole hearing that was taken from transcripts of Warner’s actual hearing that can only be described as a Catch-22. Not to spoil it, but we can only wish they were from the writer’s imagination and not from recorded history. Through Stanfield’s (Get Out) solid performance we are privileged a glimpse of Warner’s transformation from a justifiably angry victim to a quiet leader within the prison. It is not a matter of capitulation, rather a decision to live his best life—a film worth seeing.